View the progress and status of NodeSync operations for keyspace and tables in OpsCenter Monitoring. The NodeSync Status provides summary and detailed health status. Tip: The Cluster > Nodes panels also show the cluster summary progress bar. The NodeSync panel status only displays for clusters that are DSE version 6.0 and later. Enable the keyspaces and tables eligible for NodeSync status monitoring in OpsCenter. 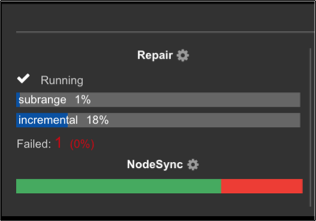 The Status tab displays the current progress of NodeSync operations. The date and time the data was last updated is displayed. The refresh data interval controls the refresh frequency. Green: Percentage% of the data was synced within the first 50% of the time period for the NodeSync deadline. 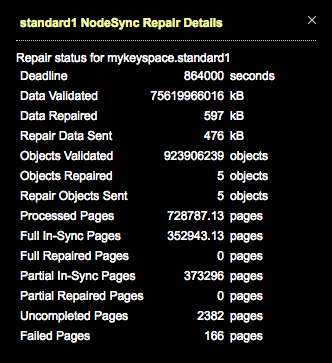 Yellow: Percentage% of the data was synced within the first 90% of the time period for the NodeSync deadline. Orange: Percentage% of the data was synced within the last 10% of the time period for the NodeSync deadline. Red: Percentage% of the data was not synced before the NodeSync deadline. An increase in configured throughput is recommended. See Configuring the NodeSync rate using LCM. If the deadline is not explicitly set for a table, the deadline defaults to whichever is greater: gc_grace_seconds (864000 seconds, which is 10 days), or the minimum deadline target (4 days). For details, see nodesync and gc_grace_seconds table properties. The following message displays if NodeSync is enabled, but no data is available yet for this cluster. Be sure to enable keyspace and tables in the Settings tab. Click the Keyspaces or Tables link to view the Detailed Health Status. Tip: Click on a progress bar section to view a tooltip with more details about progress status.